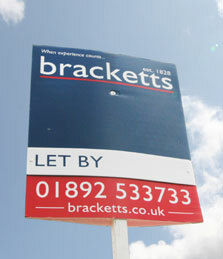 We have a dedicated Lettings Department offering a comprehensive letting service for all landlords. Whether you are letting your own home, have a one off investment or a property portfolio, we can tailor a service to meet you individual requirements. We are confident that our fees are competitive and we reassure all clients that we work in a clear and transparent manner. Our services are fully inclusive i.e. there are no hidden/additional charges, with the only exception being third party services. We are experienced in letting a wide variety of property types and sizes, from studio apartment through to large detached family homes, both in central town locations and surrounding rural areas. We pride ourselves on listening closely to our client's requirements and finding them the best possible tenant. We have lettings departments in both of our offices which are in prime town centre locations. Tenants can be assured that we offer a straight forward and competitively priced referencing and letting process. All fees our outlined clearly and upfront. We let a wide variety of property types and sizes from studio apartment through to large detached family homes, both in central town locations and surrounding rural areas. We pride ourselves on listening closely to our tenants requirements and do our best to find them the most suitable property. Once you have identified one or several properties that you would like to view, simply contact the relevant office to arrange a date and time to view with a member of staff. Viewings are generally offered Monday – Friday 9.00am to 5.30pm and Saturdays 9am to 4pm. On occasions we can offer appointments outside of these times. * For clarification, 'applicant' refers to all those over the age of 18 no longer in full time education and who will be listed as tenants on the tenancy. Please note that the application fee is non-refundable if references are unsatisfactory or you decide not to procced. The application fee is ONLY refundable if the Landlord decides they no longer wish to proceed for reasons not relating to referencing. We request a security deposit equivalent to 6 weeks rent. This is protected by one of the Government approved schemes – either The Deposit Protection Service or MyDeposits. You may be asked to pay a slightly higher security deposit depending on the circumstances surrounding your application, for example if you have a pet.